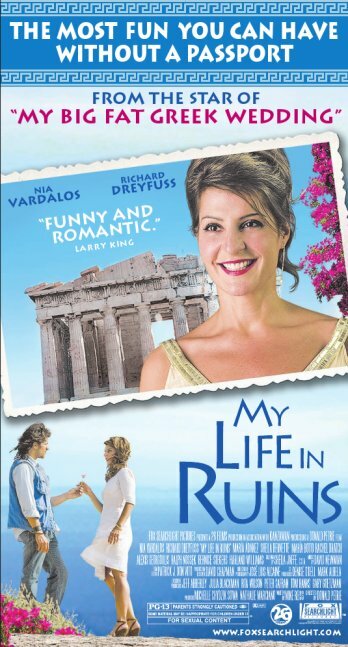 Hey, so we've got tickets to a sneak preview of Nia Vardalos' new movie, My Life in Ruins. You remember Nia Vardalos, right? The woman from My Big Fat Greek Wedding? Oh yeah, I've heard about that, so is it like a sequel? No, same actress, different character. Yeah, because I was about to say, didn't she die at the end of My Big Fat Greek Wedding? No, I'm pretty sure she didn't die at the end of My Big Fat Greek Wedding? What movie were you watching? Oh, well, nevermind. So what's this one about? Well, from what I've read, it's kind of like How Stella Got Her Groove Back, except that "Stella" is "Georgia" and "Groove" is "Kefi" and "Jamaica" is "Greece." The above exchange took place on at least one occasion prior to our viewing of My Life In Ruins on Wednesday night. Thankfully the movie isn't a sequel of My Big Fat Greek Wedding and not as simple as our off-the-cuff explanation to those Greek American friends of ours we were trying to get to come out to the screening. Surprisingly My Life in Ruins is not a bad little comedy that explores one Greek-American's acceptance of the aspects of modern Greek culture that starkly contrast with the synchronization and sterility of her American upbringing and her academic love for Ancient Greece. It's this theme that almost makes you forget that you're watching an otherwise typical romantic comedy. Along the way two men enter into Georgia's life that each in their own way makes her rediscover her kefi. The unexpected yet "expected" one in the romantic comedy formula is the Procopi "Poupi" Kakas (Alexis Georgoulis), the Renaissance man bus driver who apparently simply needs a shave and a haircut to go from brooding beast to sensitive charmer. While their eventual romance comes quite easily and there is never a doubt about whether or not they will stay together, Poupi's role in Georgia regaining her kefi is, (outside of the obvious) making her accept the inefficiencies, slower pace and no worries attitude of modern Greek life. In fact the only romantic tension in this movie is Georgia's own love affair with Greece itself, the inevitable question of will she stay or will she go, refreshingly not being about a guy but about the country and her surroundings. What distinguishes this movie however is Irv (Richard Dreyfuss) the one guy on the tour who serves as the glue for the group and seeks to have Georgia appreciate the simpler parts of what she already loves about Ancient Greek history and culture and how to share her passion with others in the group. It's his advice that allows Georgia to finally start taking some chances in her life and to stop taking herself so seriously. Outside of being a thoughtful comedy, My Life In Ruins is in many respects a 98 minute promotional video for the rich history and unknown beauty of mainland Greece. It's surprising that this is a movie that doesn't once hit a ferry to embark to Greece's storied islands but instead is set between Athens, Delphi and Olympia, the latter two sites not familiar to a mainstream American audience. (Supposedly this was the first studio film that was granted permission to shoot at the Parthenon.) Outside of a few expected jokes it doesn't trash Greece or the Greeks themselves as one could have expected and provides far less sink in your theater seat embarrassing moments for Greek Americans than My Big Fat Greek Wedding did. It leaves Greek Americans and Philhellenes alike longing to visit or revisit Greece this summer. In the end, My Life In Ruins is worth a trip to the theaters to share a few laughs with what will undoubtedly be a largely female audience (but doesn't necessarily have to be as there are enough moments of sustained laughter to make a guy forget that they are watching a "chick flick"). A working knowledge of Greek is a bonus as the subtitles for some of the Greek translations don't quite capture the comedy of the original Greek. Otherwise the film often relies on stereotypes and formulaic romantic comedy concepts that keep it from being a better film. But still it was much better than originally expected and thankfully not the "sequel" of My Big Fat Greek Wedding that we feared. Rating: 3 Goats (out of 4).